I have no intentions of making this blog completely about sports. But I am a big fan of sporting events and of life, and I am always fascinated when the two intersect as they did again this week. I'm talking about the troubles of Manny Ramirez. A little background: I've been a ManRam fan since he broke into the league with the Cleveland Indians. I was in college in the C-town and caught Indians fever as they stormed their way to the American League championship. 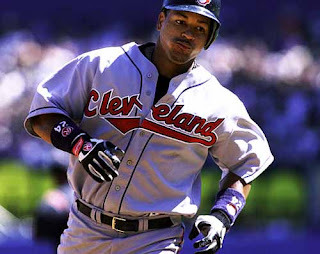 On of the best games I ever saw played was at Jacobs Field in 1995. Indians-Blue Jays. 13 innings. Albert Belle hit a bomb to win it. Great stuff. You see, for me, Manny was the last great hope for folks like me: people who romanticize sports, baseball in particular. Those of our ilk look for any way they can to hold on to the "good ol' days" when the athletes were just regular joes, driving themselves to spring training, working jobs in the off-season to make ends meet, and (supposedly) not cheating. I thought Manny was a throwback. An aloof, self-centered throwback, but a throwback nonetheless. I believed him to be above it all when it came to steroids. I knew Manny was clean, and that was enough to keep me following the game. The fact that there was at least one star that wasn't doping allowed me to tell myself that, yes, some things still are sacred. And, yes, I could still go on cheering, despite the heroes who'd fallen off the pedestal before him. And while it has not yet been proven that Ramirez's positive drug test has anything to do with performance enhancement, in my mind it seems pretty clear. If Manny needed Viagra, he'd have taken Viagra. This was for other reasons. So it all got me thinking, as a culture and as a country, have we numbed ourselves to the pain of disappointment? Have we become so accustomed to our leaders and our heroes failing us that we're more prone to shrug it off, accept it, and carry on with our lives? There's so much less outrage, so much less pain than before. What does that say about us? Are we all just cold-hearted, un-caring robots? What other conclusion can we draw? Whether it's sports or politics or religion, our "heroes" have let us down, time and again, each one more than the last. And yet collectively we give a big "Eh?" and keep on going. It doesn't seem healthy to handle the disappoinment in that way. Or (perhaps this is it) it's just plain scary to think that we're so used to being let down, that we don't even stop or hurt or grieve when it happens. Like the dog that gets used to being kicked, like the lab rats who accept the electric shock, we've numbed ourselves. And while from one angle that might seem like a good thing (We're tough! We're American! ), from another it makes me sad. Because if we don't get pissed when it happens, it's just going to keep happening. Over. And over. And then what?